How many of you remember "the good old days" pre-Internet when we spent hours in libraries and archives scrolling through microfilm in a dark room? I sure do! As books become old and begin to fall apart, librarians depend on microform to preserve their content for the future. Tiny photographs on long strips of film (microfilm) or small cards of film (microfiche) are all that remain of hundreds of thousands of documents that have disintegrated over the last century. While microfilm is perfect for storing and protecting this material, it is a does not allow for much access. In following its mission to provide universal access to all human knowledge, the Internet Archive is teaming up with libraries all over the world to begin digitizing microfilm and microfiche. The goal is to get as much content off the shelves and online. The books in this collection are from a variety of libraries including the University of Chicago Libraries, the University of Illinois at Urbana-Champaign, the University of Alberta, Allen County Public Library, and the National Technical Information Service. 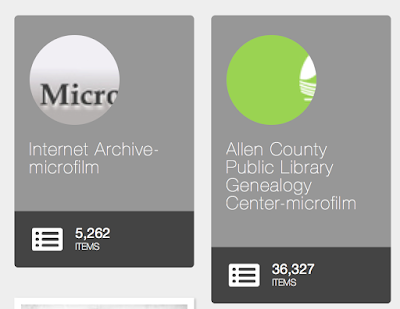 You may also want to view the newspapers that have been digitized from microfiche. So don't wait, click over to https://archive.org/details/microfilm and let your fingers do the walking! More than 60 Cemetery Walk videos are now online. 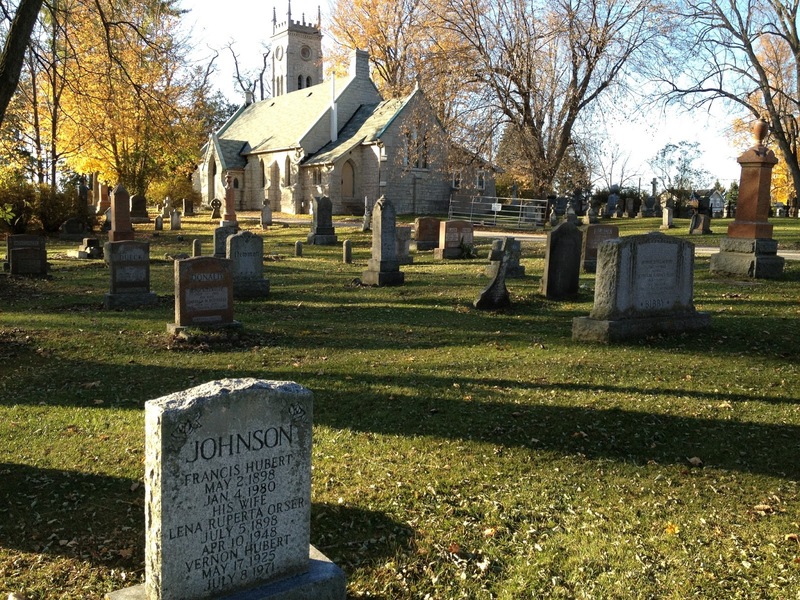 Cemetery Walk Through Christ Church Cataraqui Cemetery in Kingston. 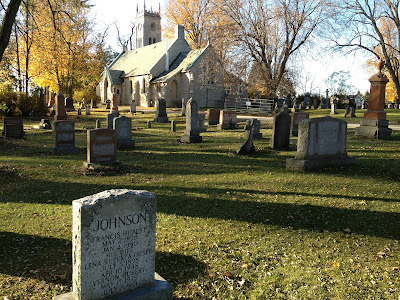 Join Olive Tree Genealogy on my YouTube channel for a Cemetery Walk through Christ Church Cataraqui Cemetery in Kingston. 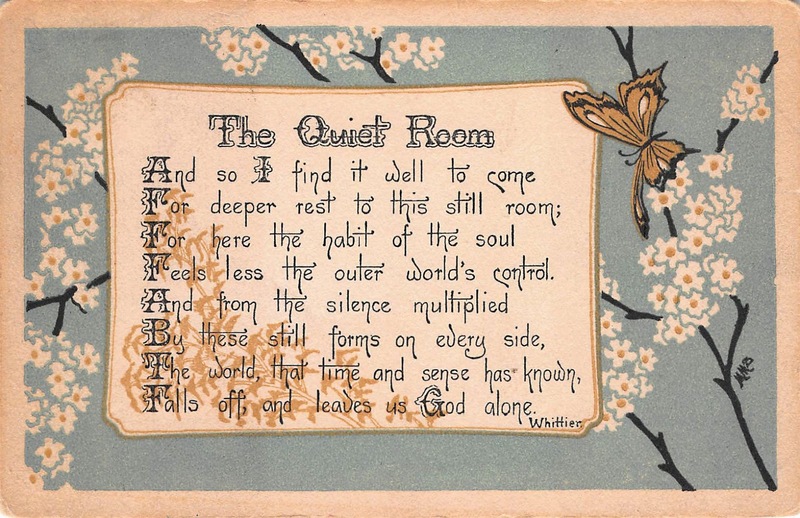 A Facebook friend posted her top 10 Genealogy Mysteries. They aren't brick walls because there is probably an answer somewhere, just waiting to be found. My 2nd Great-Grandfather Joseph McGinnis was born in Ireland circa 1829. Some time before 1846 he married Frances (Fanny) Downey. They had a daughter Bridget (aka Delia) born in 1845. In July 1846 they arrived in what is now present day Ontario. In September 1847 they baptised their daughter Fanny in Church of Our Lady in Guelph Ontario. They are not found in the 1851 census but many pages are missing. They are found in 1861 living in Puslinch Township, Wellington County Ontario, beside a very large McGinnis family. They are found again in 1871 in the same location. That is the last entry found for Joseph. What happened to Joseph? 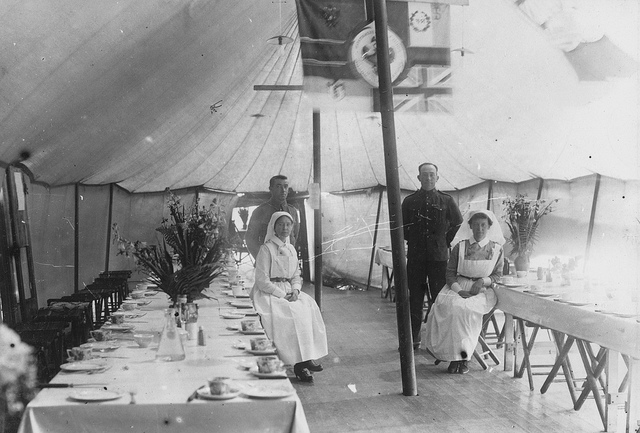 Did the family leave Canada for the USA (as many of the other McGinnis families who were Joseph's neighbours did)? Did Joseph die somewhere in the USA and Fanny returned to Ontario to be with her grown children? 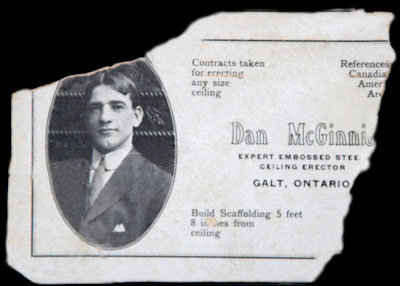 To add to the challenge there is a second Joseph McGinnis married to a woman named Fanny living in Guelph in the same time period. This Joseph died in Guelph in March 1877 but Church records prove that his wife was Fanny Foster (she died in Guelph in 1890 whereas my Fanny Downey did not die until 1904.) Most online trees have erroneously attached the second Joseph and Fanny's death dates to *my* Joseph and Fanny. So there are no clues to be found in other descendants' trees. The exact relationship of my Joseph to the other McGinnis men who were his neighbours is unknown but there was almost certainly a relationship of some sort - brother? cousin? nephew? They were sponsors at baptisms of children. They lived on the same land. They named their children with each other's names. But my Joseph did not arrived until 1846 whereas the other McGinnis family arrived ca 1831. July 1846: arrived Puslinch township Ontario and settled on Conc. 3 Lot 10 on land owned by James McGinnis, a son of John McGinnis who owned Conc. 3 Lot 11 Puslinch Tp. Some time after arriving in Puslinch, Joseph rented a tavern called "Speed The Plow" at Conc 4 Lot 6 Puslinch Tp. on the River Speed. 1861: Joseph and Fanny, both age 30, with children living in Puslinch Twp. Jan 1863 to March 1871: 4 of their children are on a list of pupils at SS # 12, Puslinch. 1873 Guelph City Directory shows a Joseph McGINNESS [sic], labourer, Norfolk & Cork St.. This is at the back of Church of Our Lady, below the hill. *But which Joseph is this?? 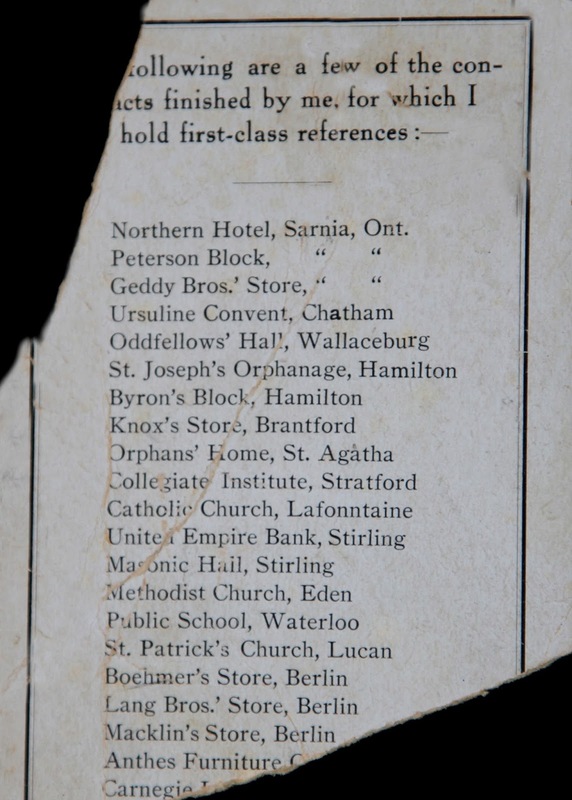 1875-1877 Guelph City Directory we see a Joseph McGINNIS, living 77 Norfolk St. east side, near Cork St. *But which Joseph is this?? 1882-83 Guelph City Directory: Fanny MAGINNIS, Mrs. widow of Joseph living 64 Cork St. near Norfolk St. Is this Fanny Foster McGinnis? I am no further ahead with this challenging missing ancestor than I was 15 year ago. Any ideas from my readers? Many of the McGinnis men left Ontario for MIchigan and I have searched Michigan for my Joseph with no luck. 64 Cemetery Walk videos are now online. Yesterday was National Centenarian's Day and I'm sorry I missed it! Do you have anyone in your family, now or in the past, who lived to be 100? My Uncle Wally (my grandfather's brother) turned 103 this past summer. Imagine living that long. If only I could chat with him about the past, about his parents, his grandparents, his brother (my grandfather). But sadly he's quite deaf and communication is challenging at best. 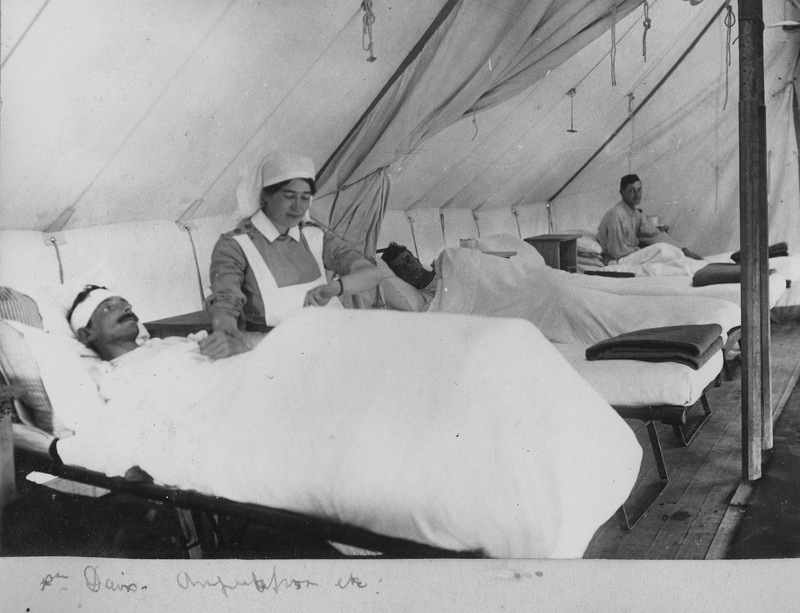 Do you have anyone in your family who lived to 100 years of age? What about into their 90s? My mother's sister turned 92 this year. 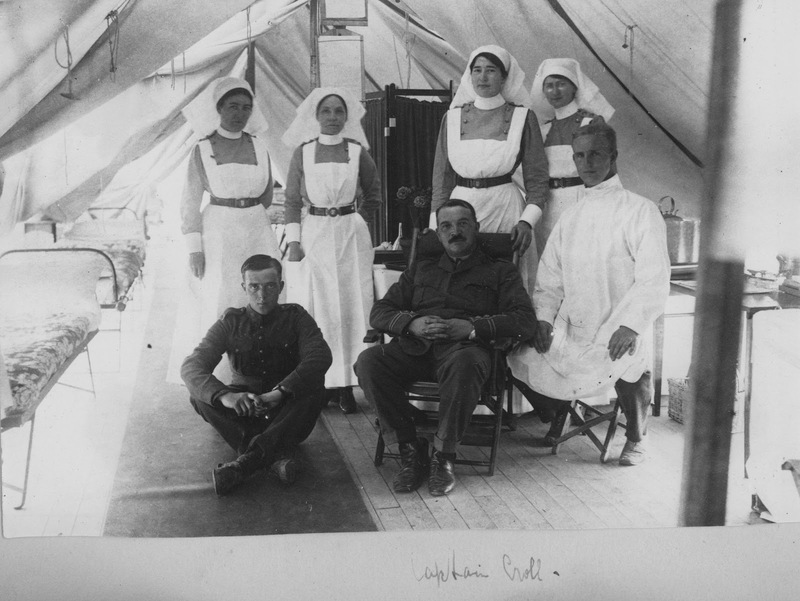 Photograph of Walter and Harold Fuller taken ca 1914 in Ramsgate, Kent England. Owned by L. McGinnis Schulze. Note that toddlers who were not toilet trained were dressed in skirts and dresses regardless of gender. It made changing diapers easier. The way to tell if a child is a boy or girl is to look at their hair. Parted in the middle is a girl, parted on the side is a boy. Photo of Walter Fuller age 4 taken ca 1916 in Ramsgate. Owned by L. McGinnis Schulze. While antique hunting I was lucky enough to come across several documents from 1879. Not wanting them to be lost, I purchased them with the plan of publishing them here on my Olive Tree Genealogy blog and on my Olive Tree Genealogy website. 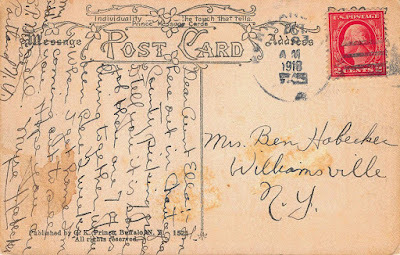 I'm also going to offer the originals for sale on my Antique Hunter blog, so stay tuned as I publish each document! This document is a Chattel Mortgage. Abstract: Hugh Russell of the Township of Delaware, County of Middlesex to Sarah Aldritt of the Village of Aylmer in the County of Elgin, widow. Sarah is putting up horses, cows, calves, wagons and farm equipment as collateral for the loan. Lorine's Research: In November 1882 the widow Sarah Aldrit [sic] of Aylmer, Elgin County died at the age of 74. 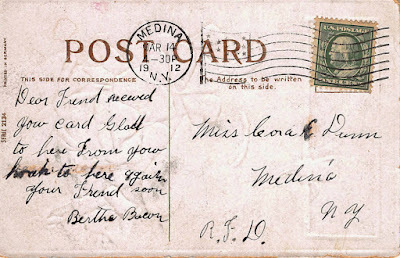 She is noted as being born in the United States. Her son's name is recorded as T. H. Davis. That clue (Davis) led me to Sarah Davis, widow, born in USA, age 73 living in Aylmer, Elgin County in 1881. 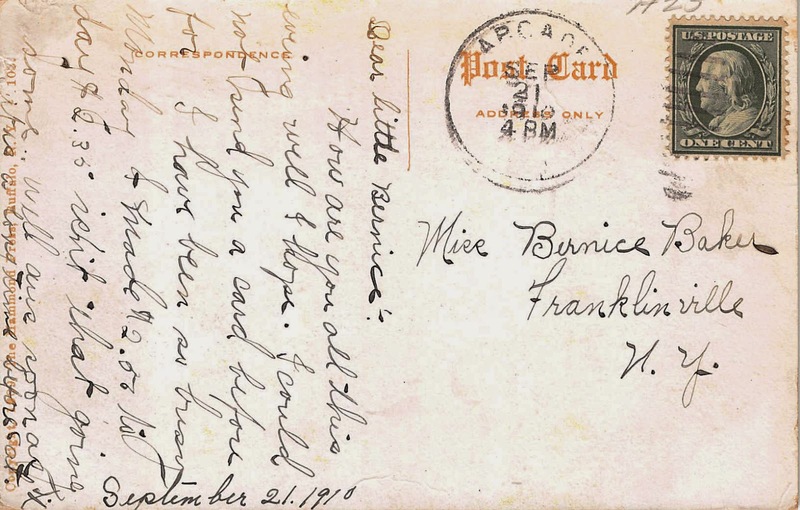 Miss Bernice Baker, Franklinville New York to "Dear Little Bernice" no signature, Sept 21, 1910. 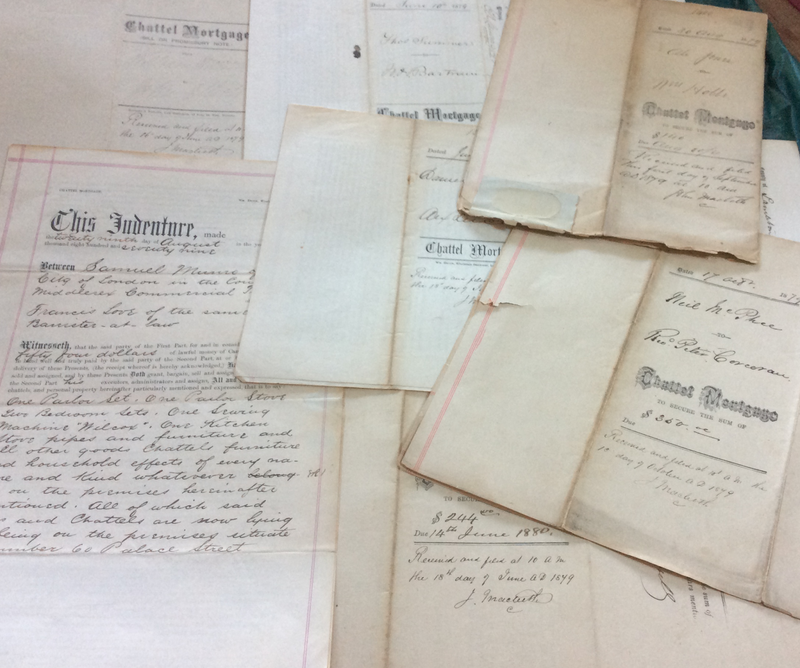 I'm also going to offer the originals for sale on my Antique Hunter blog, so stay tuned as I publish each document! The first document is a Chattel Mortgage. There is a very nice list of the items that Thomas is offering as collateral for the loan. There are 2 horses, a wagon and surprisingly, 2 plots of land. What is surprising is that my understanding of a Chattel Mortgage is that land could not be offered as collateral. For a genealogist, this is gold because it provides an exact location of land that Thomas owned. 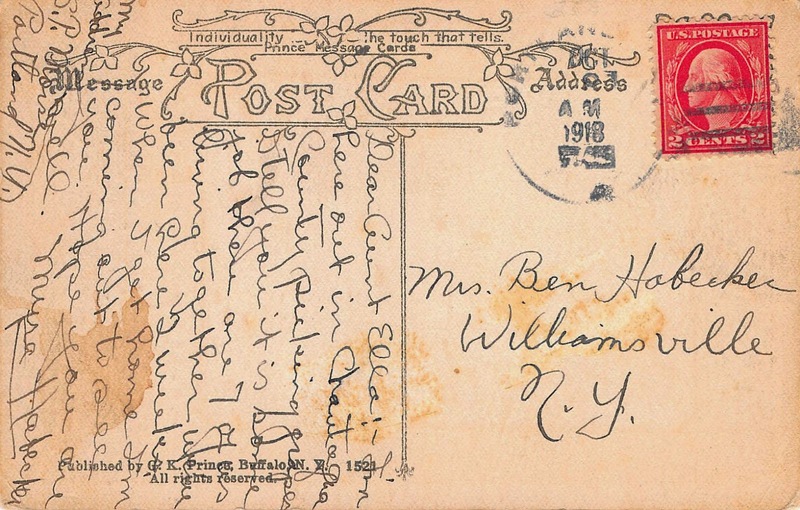 William Henry Bartrum/Bartram was born in England ca 1849. He can be found in the 1871 census for London Ontario. His marriage to Mary Jane barker in 1875 provides his parents' names as William and Emily. He died November 24, 1913 in the city of London in Middlesex County. His death Certificate gives his occupation as "Barrister" and his mother's maiden name as Soule. He was 65 years, 3 months and 3 days old at the time of his death. There is more than one candidate for being the Thomas Summers of the document. A witness to the document was Edward Arthur Lancaster, Law Student. 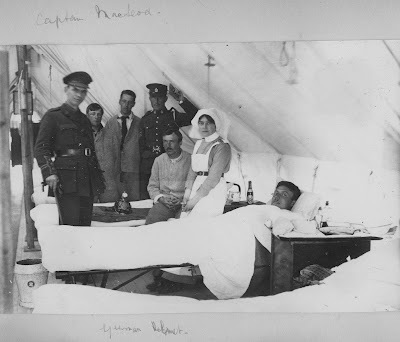 The only man I find that might be Edward was an Edward Arthur Lancaster born in England ca 1860. This Edward married in 1885 in Lincoln County Ontario. He was the son of Frederick and Emma Lancaster. More research found Edward in 1901 living in Lincoln County where he is listed as a Barrister so I have no doubt it is the correct man. His wife was Mary and 4 children plus his mother Emma are living with him. This 4-page document is for sale. It is not a copy and has the original seal. Please contact me at antiquehunterblog@gmail.com for details. Yesterday I took the day off work and went antiquing with my husband. 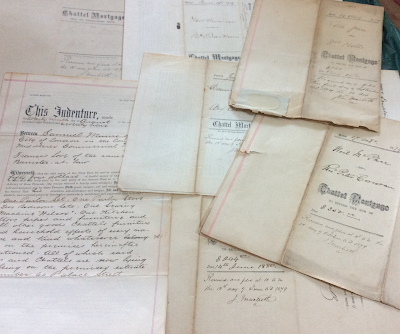 I scored with a great find of several antique documents (Indentures, Mortgages, Deeds) from 1879. With only a quick glance through them I believe they are all for different families in different areas of Ontario Canada. I'm very excited to start scanning and researching these documents and individuals. As soon as possible I will be putting the documents online both here on my Olive Tree Genealogy blog and on my Olive Tree Genealogy website. I'm also going to offer the originals for sale on my Antique Hunter blog, so stay tuned! 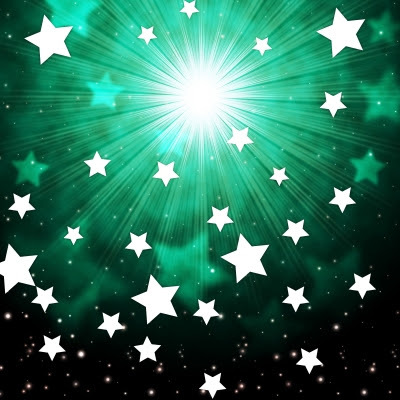 The RockStar Genealogists' Winners have been announced! These are the top in each geographic category. You can also see who won in 2nd and 3rd place for each geographic location. "Geographic location" refers to where the voters live, not the category for the genealogists. There are mostly genealogy conference speakers on the list (and excellent ones at that!) but I was really pleased to see a few bloggers make the Top 10. 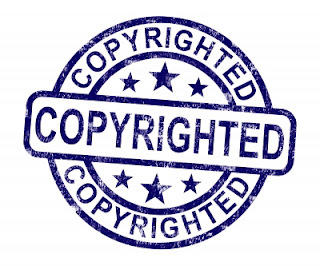 Olive Tree Genealogy received this notice from The SolutionPR about Copyright. Genealogy bloggers may wish to take note! 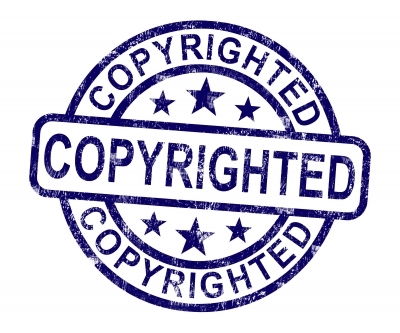 Yesterday morning the Ninth circuit ruled in the “dancing baby case,” finding copyright owners must consider the fair use doctrine before sending Digital Millennium Copyright Act takedown notices to online hosts like YouTube.If the decision stands it will have a massive impact on copyright law and those who choose to put digital content online. J. Michael Keyes is an intellectual property partner at the international law firm Dorsey & Whitney with extensive trial and litigation experience in cases involving trademarks, copyrights, unfair competition and false advertising. He has tried several cases in federal courts across the United States. Do you have a blog? A website? Are you a passionate genealogist? Are you a member of some genealogy societies, a volunteer for a genealogical organization? Are you on Twitter, Facebook, Google +, Pinterest, Periscope, Instagram, LinkedIn or another social networking site? 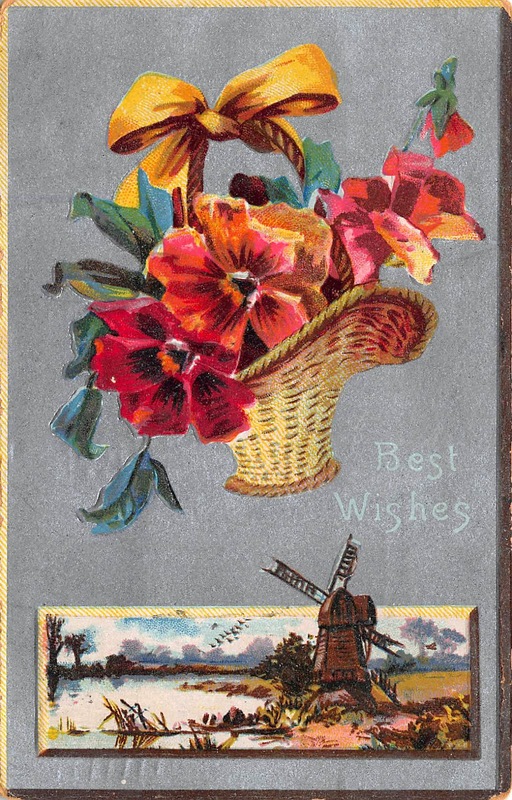 You need a card to let other genealogists know about your interests and how and where they can contact you! Perhaps you aren't involved in any of the things I mentioned above. But you love genealogy and you like to meet other genealogists. You could benefit from a genealogy calling card. Think of the 19th Century when visitors handed their calling cards to servants who placed them on a silver tray for the head of the house or his wife to look at later. 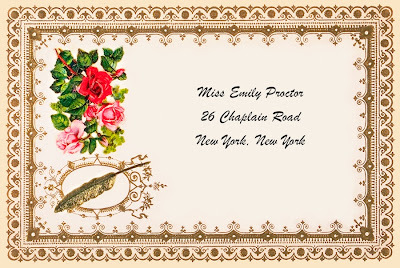 I'm not advocating anything as fancy as the Victorian calling card shown here but a simple calling card is a great introduction and a good way to ensure that genealogists you meet will remember you. 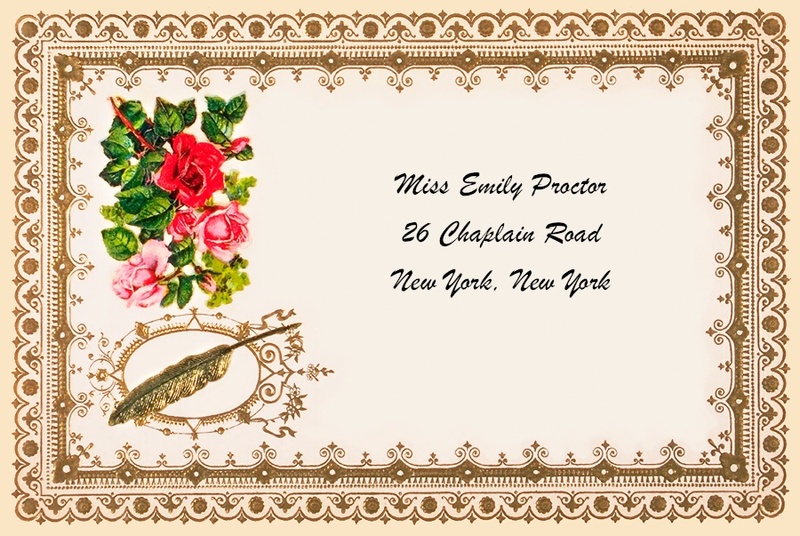 Kerry Scott, from Clue Wagon blog, wrote a very interesting post in 2011 called What Do Modern Business Cards for Genealogists Look Like? 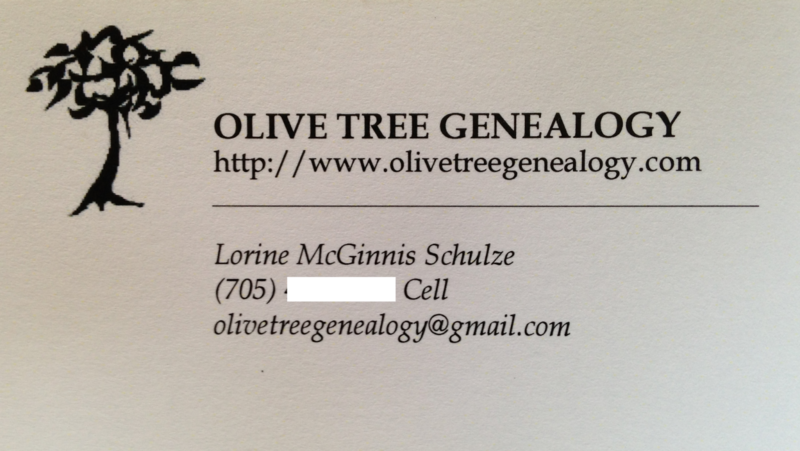 The business cards that I printed for RootsTech 2011 were too simple. And I wish I'd done colour for my logo, not just black and white. I like simple. I like uncluttered. But mine don't contain enough details and I may take Kerry's suggestion and remove my cell phone number. If I want someone to have that I can easily add it, because unlike Kerry my cards are not glossy and they aren't double-sided. It's a personal preference re glossy or matte, there's no right or wrong. So I'm reviewing and re-doing my Business cards this year. I've got a funky case I carry them in (thanks to my granddaughter who gave it to me in 2011) and I need to update my cards. I'm thinking I'll add my Twitter, Pinterest, Instagram and Facebook information so that folks have other methods of connecting with me. Oh and no QR codes on mine. A lot of people don't know what those codes are for on a business card, and I'm not convinced of their usefulness on a card that already has the information printed. This is a business card printed for a distant McGinnis cousin of mine back in the early 1900s. He used front and back to promote his business as a builder. 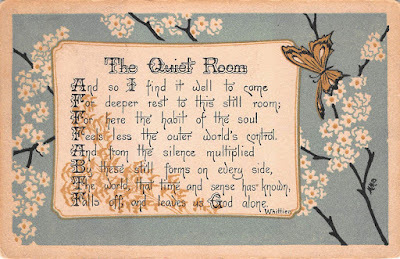 I hope you are going to create calling cards or business cards for your next genealogy convention or think about whether or not it's time to revise old ones. 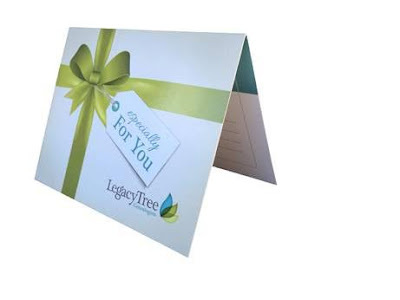 There are many online companies that print business cards for a reasonable fee. 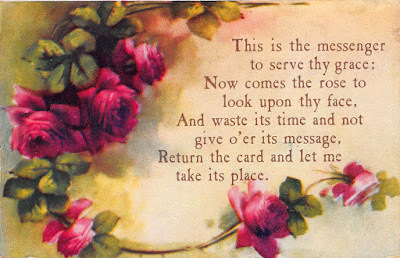 So don't wait, think about which you prefer - modern business cards or old-fashioned calling cards. Or maybe you will surprise everyone with a combination of the two. 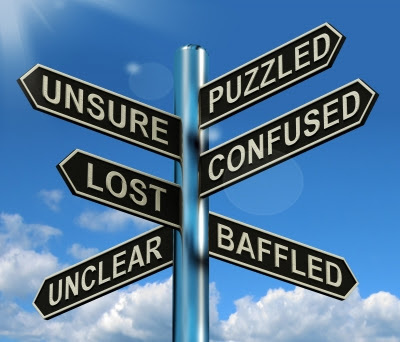 Patronymics - Are they Confusing or Helpful to Genealogists? Q: After 200 years of historical accounts of the immigrants from the Netherlands, debate is still continuing when the surname Teunise/Teunisen is researched. 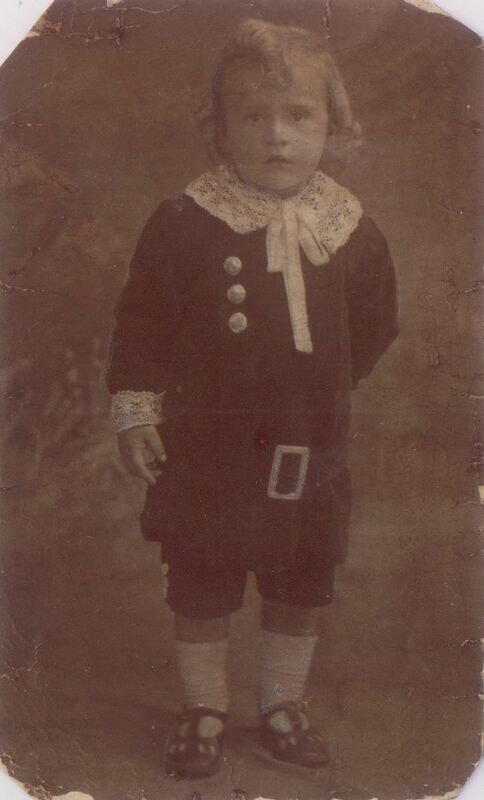 My ancestor was Teunis Nyssen, who had 7 children based on baptism records, one (Cornelis) from guardianship record after his mother Phoebe Janse died. By 1660, when the 2nd generation started marriage and having children, the names of daughters were Teunis with an “e” added and sons with “en”. 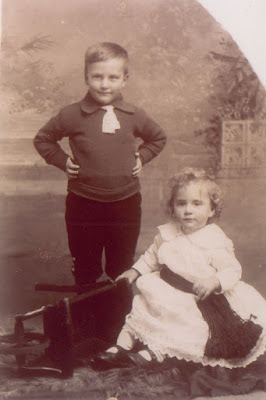 Historians and genealogists either made decisions which person had which “Teunis” father, so for the children of Teunis Nyssen, Denyse was added to the name “de Nys, or of Nys, as opposed to child of Teunis Bogaert. Is my assumption on the addition of the “e” and “en” correct? A: The simple answer is "NO". The patronymic was formed by adding -se, -sen, or -szen. Daughters would very often have the ending -x or -dr. added. I suggest that what you are finding ("e" vs "en") is simply the way the name/patronymic was recorded by that specific clerk or individual. 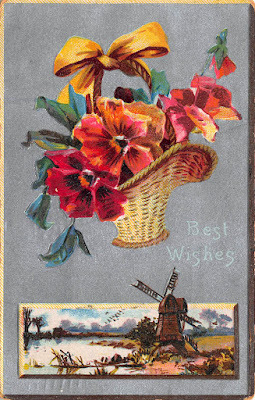 See Dutch Patronymics of the 1600s for more help. Researching the Dutch in New Netherland is not an easy task. It requires years of study to understand naming patterns, customs, patronymics etc *and* to find the records to assist in the research. There are records that Dr. Gehring has been working on translating from the Dutch for over 25 years now! This year, save money with $100 off any research project if ordered by December 23, 2015. Use coupon code HOLIDAY100. Get started now to complete your project by Christmas. This is a fascinating (and inspiring) story of one genealogist (Brooke Schreier Ganz) and her fight to gain access to public records. Please read the full story at Public Records Access: One Genealogist Can Make A Difference! Ms. Ganz is seeking access to copies of the 1908-1929 index to marriage licenses and affidavits, a series originally kept by the New York City Clerk’s office, now stored at the NYC Municipal Archives. In her story we see what dedication and perseverance can accomplish. In the end Brooke Schreier Ganz's fight will benefit all genealogists. The Power of One is amazing! 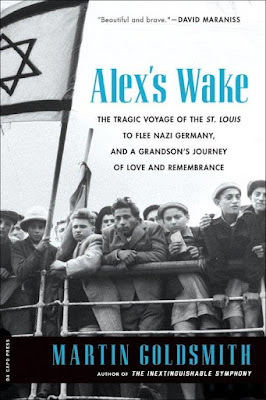 Alex's Wake: The Tragic Voyage of the St. Louis to Flee Nazi Germany—and a Grandson’s Journey of Love and Remembrance by Martin Goldsmith. 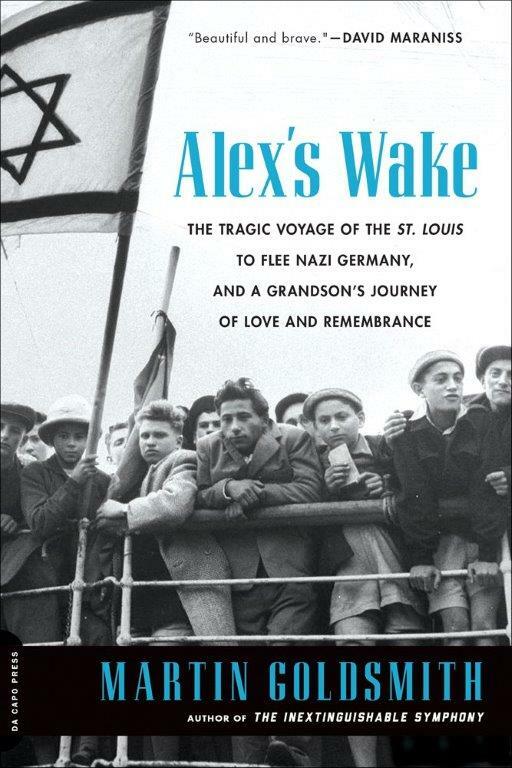 This is the story of Alex and Helmut Goldschmidt two of more than 900 Jewish refugees who fled Nazi Germany aboard the St. Louis in 1939. Decades later, Alex's grandson Martin Goldsmith tells the poignant tale of how the ship was denied entry into Canada, United States and Cuba. The ship returned to Europe where Alex and Helmut were sent to Auschwitz where they died. 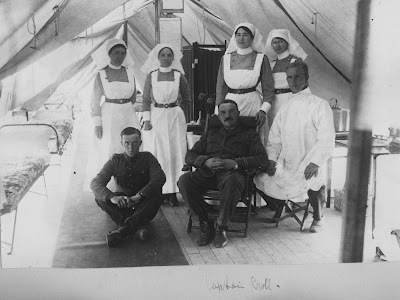 To write his story Mr. Goldsmith traveled in his grandfather's footsteps to revisit those horrific days. It is a moving and sad story of reconnecting with the past and taking a powerful journey with his grandfather and grandfather's brother. 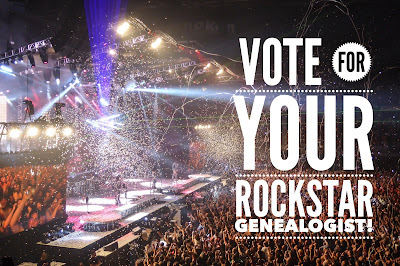 Rockstar Genealogist Voting is now open! 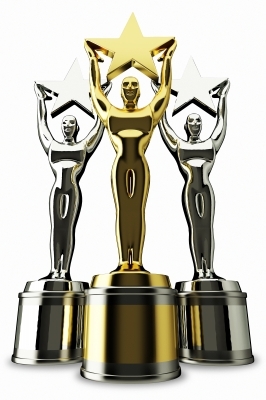 Hurry over and vote for your favourite genealogist from the list of nominees. 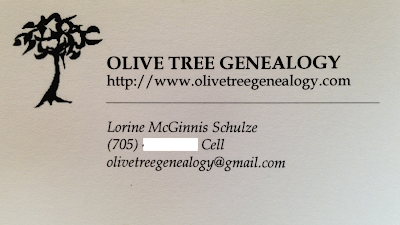 Olive Tree Genealogy is on the list under "S" as Lorine McGinnis Schulze in case you wanted to cast a vote my way. It's okay if you don't vote for me, but you should vote for someone. On my AskOliveTree Blog Pamela asked about naturalization records for her ancestor William Galbraith. My response can be read at Search all the Children not just your Direct Ancestor! 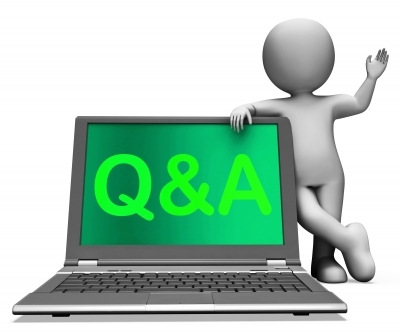 Feel free to send your challenging genealogy queries to AskOliveTree@gmail.com for me to answer. Sometimes I do actual research on your behalf, sometimes I just point you in the right direction to find answers on your own! I post a Q&A every Thursday, more often if possible. Time for a bit of fun. You can nominate your favourite genealogist for John Reid's Rock Star Genealogist contest. Check out the list of nominees and add your own if he or she is missing. "Rockstar genealogists are those who give "must attend" presentations at family history conferences or as webinars. Who, when you see a new family history article or publication by that person, makes it a must buy. 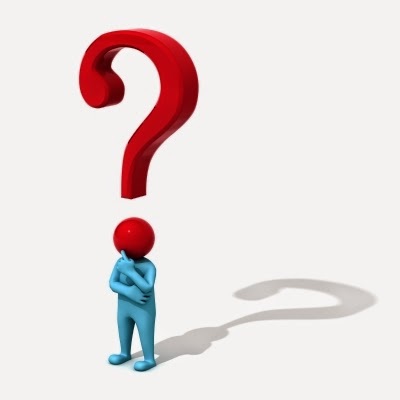 Who you hang on their every word on a blog, podcast or newsgroup, or follow avidly on Facebook or Twitter?"